This thing was a big disappointment for me. The smell from the phthalates makes my head feel weird, it doesn't get as warm as another warmer I tried, and the packaging could be more accurate. Also, if you only read French and no English, all you will be able to understand is "reusable" and "Made in China". The instructions and warnings are only in English. Due to the material and the smell, I will not be keeping this. This is not the full review! Please click here to read the full review. There are more pictures and details there, including information on the science of how the liquid turns into a warm solid. What you are reading on this page is only a summary, not the full review. This was a complete waste of money, in my opinion. I could hardly stand the smell of it, and had to get rid of it ASAP. I would not recommend this. You're welcome ^-^ Nice to meet a fellow Potterhead! 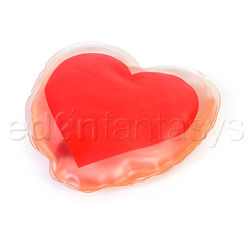 Thank you for viewing Heart's Desire warming massager review page!